Though few contemporary romantic comedies, even great ones, have managed the feat of scoring big at the Oscars, it wasn’t always so: William Wyler’s sweet, slightly melancholy, and relatively low-key Roman Holiday was nominated for 10 Academy Awards and won three, including two in the top categories. One was for Audrey Hepburn, who won Best Actress in her first Hollywood at-bat, for a role that now seems tailor-made for her: She plays a beautiful princess who gets a stylish short haircut. Perhaps more importantly, she also bonds with a journalist (Gregory Peck) after escaping her goodwill-tour obligations in Rome. Ann (Hepburn) doesn’t realize that she’s being shown Rome by a reporter; Joe (Peck) hides his profession, as most journalists in romantic comedies must, in this case hoping for a big interview payday. Hepburn’s Oscar for this role is well-known; the film’s second major win wasn’t officially awarded for another 40 years. The Academy Award for Motion Picture Story (a category later absorbed into Best Original Screenplay) originally went to credited co-writer Ian McLellan Hunter. But Hunter was fronting for blacklisted screenwriter Dalton Trumbo, whose real name was posthumously scrawled on an Oscar statue in 1993. 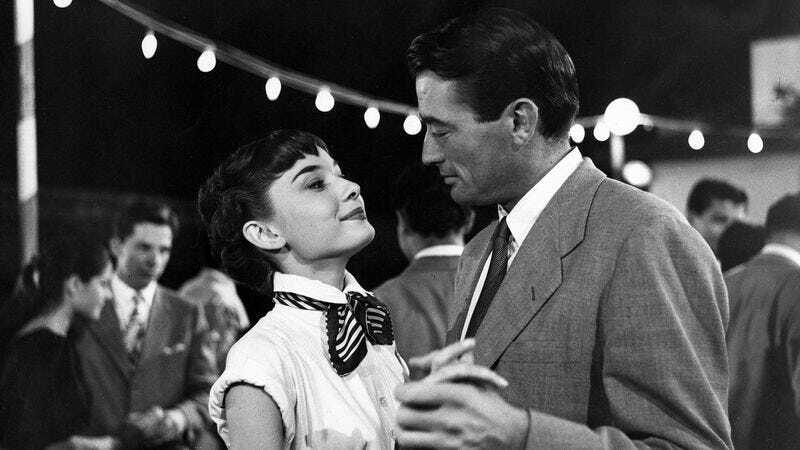 The writing in a movie like Roman Holiday doesn’t always get a lot of attention; so much of its immediate charm has to do with its two now-legendary movie stars and its formidable scenery, captured in gorgeous black and white, often on location. Hepburn, Peck, the Spanish Steps, Trevi Fountain, the Mouth Of Truth… that’s a lot of iconography for one movie. But the screenplay by Trumbo and John Dighton helps ground those icons in human emotion. Peck and Hepburn aren’t exactly fast-talking farceurs—one of the film’s biggest comic moments, at the Mouth Of Truth, is basically a gentle prank with a big music sting. They’re supported by a script that arguably influenced the likes of Before Sunrise just as much as, if not more than, the fairy-tale tone one might typically associate with romantic comedies about princesses and/or deceptive journalists. The bittersweet notes the movie hits as it moves along, building to a perfect final scene, are their own kind of magic. Availability: Roman Holiday is available on DVD from Netflix or your local video store/library. It’s also available to rent or purchase through the major digital outlets, and is currently streaming on Netflix.